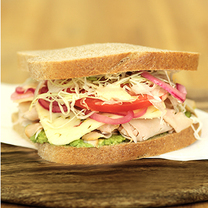 Thin slices of smoked turkey breast with a flavorful chipotle honey lime yogurt sauce, shaved cabbage, pickled red onions, avocado, and pepper jack cheese. 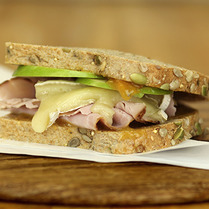 Served on your choice of bread: Dakota, White, Honey Wheat, Sourdough, or Rye. 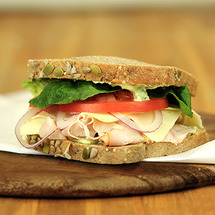 Avocado, parsley, basil, tarragon, scallions, and lemon juice creates the delectable goddess dressing drizzled atop smoked turkey breast & creamy havarti cheese, tomato, lettuce & red onion. Served on your choice of bread: Dakota, White, Honey Wheat, Sourdough, or Rye.